I LOVE this recipe. It comes together in about 10 minutes so it’s perfect for lunch, a snack, light dinner (serve it with a salad) or a quick appetizer. If you want to cut calories and fat, you can omit the cheese inside the quesadilla and only use the feta in the red pepper sauce. I have done that and it was still popular. These quesadillas are so, so, so easy and delicious! Make the sauce first. 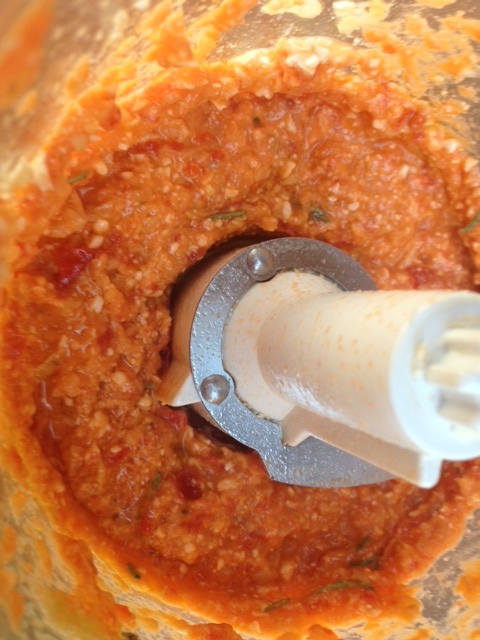 Place feta and roasted red pepper slices in a food processor and process for 30 seconds. Set aside. Next, mix chicken, hummus, onion, cumin, and olives together and set aside. Place mixture in half a flour tortilla shell (so when you fold it over it looks like a half moon). Top the mixture with cheese. Preheat a nonstick skillet sprayed with cooking spray over medium heat. When hot, place the folded quesadilla down and cook about 3-4 minutes per side. If desired, garnish with parsley or cilantro (I did this more for the photo than the taste). Remove and top with red pepper sauce and serve immediately. This entry was posted in Appetizers, Juliana's Favorites, Sandwiches and tagged apppetizer, cheese, feta, hummus, lunch, meditteranean, middle eastern, olives, quesadilla, red pepper, rotisserie chicken, snack, tortillas on June 12, 2015 by Juliana Goodwin. 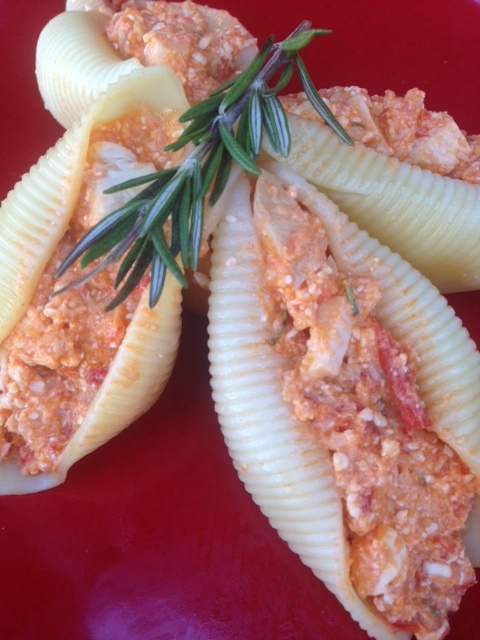 Jumbo Shells Stuffed with Feta, Roasted Red Pepper Sauce and Chicken- SO EASY! This dish comes together so quickly that the longest part is typically boiling water. It’s an excellent dish and is good warm, at room temperature and even cold, so you can pack any leftover for lunch. In the winter, I add dried rosemary, but in the summer, sprinkle the dish with fresh basil. In this dish, you use 2 ounces of feta cheese crumbles and to give you perspective, the containers in the store are usually four ounces, so you want half that much feta. This pasta just explodes with the flavor of feta, roasted red pepper and has lean protein. 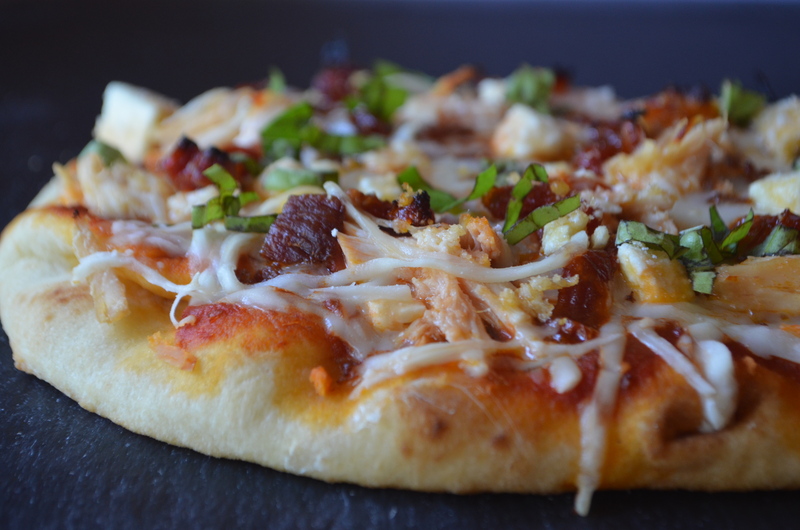 It’s easy and do delicious. Cook jumbo shells according to package directions (usually about 12 minutes). Drain. While the shells cook, place feta cheese, artichoke hearts and roasted red peppers in a food processor and pulse until mixture is fairly smooth. You will see plenty of specks of feta and that is fine, but you want the red pepper and artichoke to be smooth. Finely chop your chicken and stir it into the roasted red pepper sauce. Add a pinch of dried rosemary or fresh basil. If I have fresh basil, I garnish the tops of the dish with it. When shells are cool enough to handle, spoon filling into shells and serve. It’s that easy! Enjoy. In terms of vegetables, this goes great with sautéed spinach or roasted asparagus. This entry was posted in Main Courses, Pasta and tagged artichokes, basil, dinner, easy, feta, feta cheese, meditteranean, pasta, quick, roasted red pepper, rosemary, rotisserie chicken, shells, spring on March 16, 2015 by Juliana Goodwin.